The Brainport is seen on a table. A pair of dark grey shades with a small camera built into the bridge are connected to a control panel the size of a smartphone+. 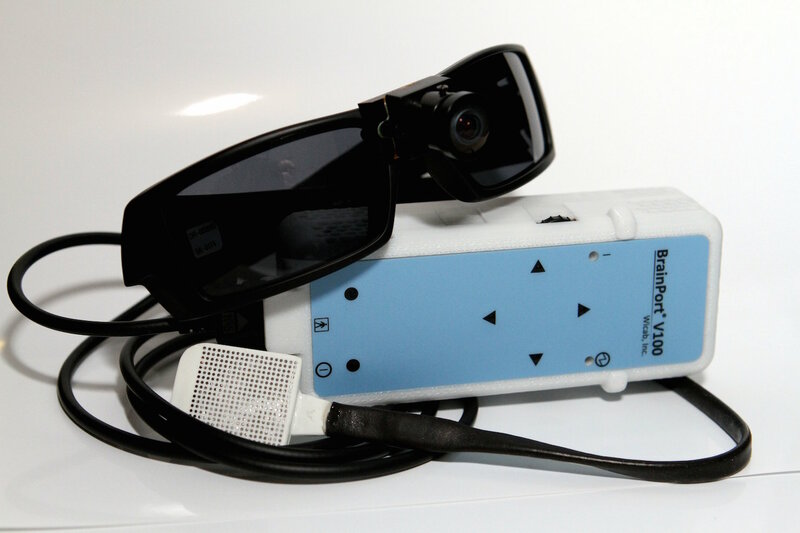 The Brainport V100 is designed as a visual aid for people who are blind. Using a unique intra-oral device, a user is able to 'see' images using their tongue! A video camera mounted on a pair of sunglasses transmits the image that is is seeing to the intra-oral device, which is placed in the user's mouth on the tongue. The intra-oral device then converts the image from the camera into electrical impulses on the user's tongue, essentially drawing the image on the tongue and allowing the user to 'see' it.